The project is funded by the Mid­America Earthquake Center (Dr. Dan Abrams, Univ. of Illinois, Urbana Champaign) that was recently established by NSF; with matching funds by Georgia Institute of Technology (Dr. Jean­Lou Chameau, Dean, College of Engineering)with complementary program is underway at UIUC by Prof. Tim Stark. Liquefaction is the result of excess porewater pressure generated in saturated granular soils from rapid loading, such as earthquake shaking. A study of liquefaction and related soil properties can lead to an understanding of a specific deposit's resistance to earthquake vibrations. Liquefaction evaluation can include laboratory as well as in-situ methods. Due to the difficulty and expense associated with obtaining undisturbed field samples of sandy and silty soils, in-situ tests have become popular for evaluating how a soil deposit will respond under earthquake loading. Empirical relations between in-situ test resistance parameters are commonly compared to liquefaction resistance of soil deposits that were subjected to historic earthquakes. Liquefaction analyses are then based on simplified curves generated from large databases of sites which have surface evidence of liquefaction, as well as those where no obvious liquefaction has occurred. This can lead to additional uncertainty in a liquefaction analysis when dealing with Mid-American soils, since databases predominantly contain sites from China, Japan, and the western United States. The new Mid-America Earthquake Center (MAEC) established by the National Science Foundation (NSF) has been developed to focus on seismic hazards associated with the New Madrid earthquake region and Charleston, South Carolina earthquake region. This poster will summarize tests performed to analyze the liquefaction response of Mid-American soils. 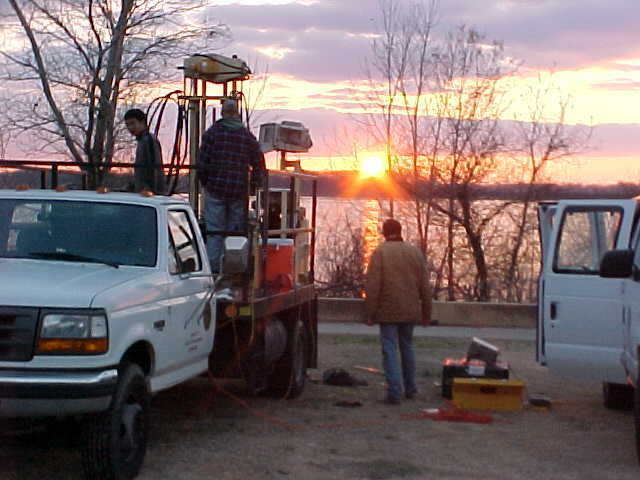 In-situ tests have been performed at a number of test sites in the heart of the Mid-America earthquake regions (Fig. 1). Testing areas include Charleston, SC, Memphis, TN, West Memphis, AR, Blytheville, AR, and Steele, MO. Predominantly seismic piezocone penetration tests (SCPTu) have been performed, but other tests performed include u1 and u2 piezocones (CPTum), flat plate dilatometer tests (DMT), and piezovibrocone penetration tests (PVCPT). Soundings in excess of 30 meters have repeatedly been performed so that site amplification analyses may be performed to accompany liquefaction evaluation.